A quick glance at the specs of the current crop of netbooks might lead you to believe that they're more alike than different. Nearly all of them are based on the same Intel Atom CPU (the N450), with 1GB or 2GB of RAM, no optical drive, and similar battery-life claims. But look closer, and you can see that various models are designed with different people in mind. If you're interested in using your netbook for entertainment, such as watching high-def video or playing the occasional game, you'll want a model with a larger screen and a good graphics processor (nVidia's Ion or AMD's low-power platform with ATI graphics). You'll pay more and give up some battery life, though. If you frequently take long business trips or need to get a little work done on the train or plane, you'll want a netbook that maximizes battery life to obviate the need for an outlet until you get home for the evening. As a business traveler, you may find on-the-go connectivity, rugged design, and a terrific keyboard and touchpad to be more important than raw performance. Maybe performance and price don't matter to you as much as a netbook that looks good and has first-rate design, even if you have to pay more to get it. Perhaps you find yourself on the other side of that coin, looking for the least expensive netbook that will get the job done, as a companion to your everyday PC. Whether you're looking for a netbook with lengthy battery life, useful business features, a small price tag, innovative design, or great entertainment capabilities, read on for our top choices in each category. Do you just want a good all-around workhorse? Our Top 10 Netbooks chart will tell you which netbooks we think are the best overall. 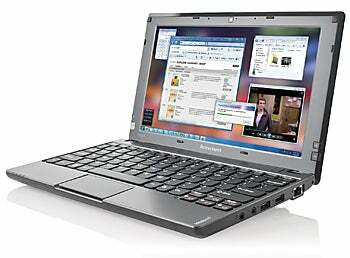 Lenovo's IdeaPad S10-3 is designed for business users, with a great keyboard and a multitouch touchpad. Everything Lenovo sells, including the $369 IdeaPad S10-3 netbook, appears to be intended for the boardroom or meeting room. This 2.6-pound, business-oriented model is a bit pricier for its specs than the competition. Most other 10.1-inch, 1024-by-600-resolution netbooks with the same 1GB Intel N450 CPU and 3150 GPU combination sell for $10 to $50 less; they also have a more-capacious 250GB hard drive (the S10-3's is 160GB). While 160GB is more than enough for most users, you are still getting a little less of the basics and paying a bit extra for the business features and software. Or is it the ergonomics you're paying for? The innovative multitouch combination of touchpad and rocker button on the S10-3 is a relief for anyone (including this writer) who hates inadvertently tapping while dragging or hunting for buttons. Simply apply a little pressure to the bottom left or right corner of the device, and you have your click. Another time-honored Lenovo strength is the keyboard, and the S10-3 doesn't disappoint there either. The typing feel is as good as you'll find on a netbook, with no scrunched or misplaced keys. Working with this netbook feels less like using a netbook than doing so with any other 10.1-incher I've ever tried. Lenovo also bundles some interesting software. Most of it, such as the VeriFace facial recognition security, is aimed squarely at business users. Lock down the system with a password, and VeriFace will log you on by scanning your mug using the Webcam. It works rather well, and is fun. But logging on this way is slow and gets tiring after a while. Additional apps include DirectShare, which syncs files and folders across your network, and OneKey Recovery, which images your hard drive for disaster recovery (though Windows can do this). Unfortunately, you don't get even Microsoft Works. No doubt Lenovo thought business users would have their own productivity suite, or would activate the Office 2007 trial. Other specs are standard for netbooks. You get three USB ports: one on the left with the VGA port and SDHC slot, and two on the right with the ethernet and audio in­­put and output. The AC port and a wireless switch are on the left. The hard drive, memory, and free Mini PCI Express slot are easily accessible via a removable panel on the bottom. The Lenovo IdeaPad S10-3 ran for 8 hours, 27 minutes in our battery tests, but its performance score of 31 on WorldBench 6 is subpar even for a netbook, and the Windows 7 Starter operating system feels sluggish (Lenovo piles on background processes via software that duplicates Windows capabilities). Uninstalling unnecessary apps helps quite a bit. Regrettably, 720p HD video played smoothly only when transcoded to the very efficient QuickTime MP4 codec. WMV was a complete fail, and other MP4 implementations continually stuttered or stalled. On the other hand, audio through the S10-3's speakers sounded better than on most netbooks. Though it's pricier, slightly less well-configured, and slower out of the box than much of its competition, Lenovo's IdeaPad S10-3 is a netbook that remains more than the sum of its parts. Give its ergonomics a try. The Gateway LT2118u can run for a staggering 11-plus hours on its six-cell battery--plus, it's stylish and easy to upgrade. You'll be amazed at the run time of the $350 Gateway LT2118u. With Intel's Atom N450 CPU and 3150 GPU at its heart, as well as 1GB of memory, a 250GB hard drive, and a 10.1-inch, 1024-by-600-resolution display, Gateway's pride and joy carried on for an astounding 11 hours, 17 minutes in the PCWorld Labs' battery tests. But how can a netbook that supposedly differs from its LT2120u sibling only in color run more than an hour and a half longer? As it turns out, the LT2118u uses a UMO9H36, 5600-milliamp-hour/63-watt-hour battery--while the LT2120u uses a UMO9H56, 5800-milliamp-hour/63-watt-hour model. From those specs, you would expect the UMO9H56 to run longer, but we found no other difference in the BIOS or components, so apparently the UMO9H36 is the better option. The LT2118u's upper cover is a rich red with the rest of the unit in dark grays--a surprisingly classy look. The ports are standard for a netbook: two USB ones on the left, along with the AC jack and a VGA port, plus one USB port on the right with the audio in/out and a 10/100 ethernet port. A Kensington lock port is also on the right edge, as is an SD Card slot. At 2.7 pounds, this netbook has about average heft for a 10.1-inch system with a six-cell battery. The hard drive and memory module are both accessible via screw-secured access panels on the bottom. A vacant Mini PCI Express slot is underneath the hard-drive panel for a possible broadband or other upgrade. Overall, the unit is a hardware tweaker's delight. The LT2118u played high-def 720p WMV, QuickTime, and MP4 videos smoothly, though online Flash video and Flash-based gaming were noticeably jerky--extremely so with content at higher resolutions. Audio was fine through headphones, and decent enough through the speakers. The 640-by-480 Webcam's images and recording were exceptionally smooth, and a pop-up Webcam utility appears when you roll over it with the mouse at the top of the screen. 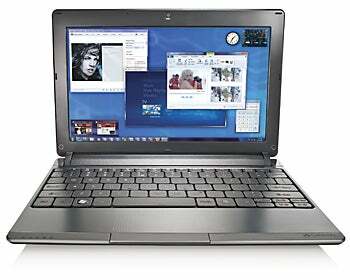 The LT2118u, though it handled video a bit better than the average N450/3150-based netbook, scored the same 33 points on WorldBench 6 that most netbooks do--including its aforementioned sibling, the LT2120u. Overall, this gives the unit the same less-than-snappy but workable feel we've become used to with Windows 7 Starter netbooks. Most people should adapt to the LT2118u's keyboard just fine, as the majority of the keys are where you'd expect them; the feel, while a tad light, lends itself to touch-typing. One caveat: A large gap between the keys leaves a ton of space for dust and particles to collect. Vacuum this puppy regularly. The touchpad is stylish, and has raised bumps that make it easy to find by feel while remaining unobtrusive. You'll want to spend a few minutes ditching the preloaded software flotsam--with innumerable icons blanketing the desktop--but dig around a bit, and you'll also find a copy of the ever-useful Microsoft Works. The LT2118u is all about style and endurance. It's a cut above the average netbook in looks and is easy to upgrade--and if you tend to have pretty long workdays, you'll love the machine's 11-plus hours of run time.